In 1858, Wallmann first reported on colloid cysts. In 1921, Dandy accomplished the first successful resection of a colloid cyst through a transcortical transventricular approach. Since then, different operative approaches such as transcortical-transventricular and transcallosal were developed. [1, 2, 3, 4, 5, 6, 7, 8, 9, 10] Less invasive techniques were then developed as an alternative to reduce the complications of the open approach. Freehand aspiration of a colloid cyst was performed first by Gutierrez-Lara et al in 1975. The first stereotactic aspiration of a colloid cyst was performed in 1978 by Bosch et al. Endoscopic aspiration of a colloid cyst was reported by Powell et al in 1983  and has progressively gained consensus as a safe alternative treatment. The image below depicts a colloid cyst at the foramen of Monro causing hydrocephalus. Axial CT scan that shows a colloid cyst with associated hydrocephalus. Although these tumors are considered congenital, their presentation in childhood is rare (the youngest reported case involved a 2-month-old infant). The increased use of CT and MRI has resulted in an increased number of patients being diagnosed. No known genetic relationship has been determined, although familial occurrences of colloid cysts have been reported. The etiology of this tumor is still a source of debate. In 1910, Sjovall hypothesized that colloid cysts were remnants of the paraphysis, an embryonic midline structure within the diencephalic roof immediately rostral to the telencephalic border. The cells of the paraphysis are similar to those found in colloid cysts, (ie, low columnar epithelial cells without cilia or blepharoplasts). These cysts were called paraphysial cysts for 50 years; however, several reports have been written about colloid cysts found in other locations, including the posterior third ventricle, the fourth ventricle, and the septum. Rare locations in the frontal lobe,  cerebellum, and pontomesencephalon have also been described. The origin of these cysts continues to be uncertain. Diencephalic ependyma, invagination of neuroepithelium of the ventricle, or the respiratory epithelium of endodermal origin are other etiologic possibilities. One leading theory is that colloid cysts form when ectopic endodermal elements migrate into the velum interpositum during central nervous system embryonic development. The fact that they are rarely seen in children indicates that they must enlarge with time. The cyst wall is lined with a mixed array of epithelial and goblet cells secreting proteinaceous mucinous fluid and may be responsible for the increase in size of the cyst. In addition, cyst cavities may be filled with blood degradation products such as cholesterol crystals. Colloid cysts are often found incidentally, but when symptomatic, they present with obstructive hydrocephalus and paroxysmal headaches. These headaches are typically worse in the morning and may be exacerbated by leaning the head forward. Other symptoms are gait disturbances, short-term memory loss, nausea, vomiting, and behavioral changes. Sudden weakness in the lower limbs associated with falls and without loss of consciousness (drop attacks) have been reported. Additionally, symptoms similar to normal-pressure hydrocephalus (eg, dementia, gait disturbance, urinary incontinence) have been associated with the presentation of colloid cysts. The most significant variable of these was ventriculomegaly. For patients with enlarged ventricles, patient age (≤50 y vs >50 y) was the most important variable because patients aged 50 years or younger with enlarged ventricles were not affected by cyst size. The most common indication for surgery is hydrocephalus associated with a colloid cyst. This usually occurs in the setting of a large cyst that obstructs the foramen of Monro. A more difficult clinical situation occurs when patients present with few or no symptoms and have small colloid cysts and large ventricles. In many cases, these patients may be managed conservatively and observed with serial MRIs, but they should be counseled about the potential symptoms of hydrocephalus. Lastly, patients who have small cysts and normal-sized ventricles are not likely to deteriorate and do not need surgery. Sudden death associated with colloid cysts has been reported, but the risk of sudden death does not seem to correlate with tumor size, degree of ventricular dilatation, or duration of symptoms. Fortunately, the incidence of sudden death appears to be low; therefore, prevention of sudden death should not be used as an indication for surgery in asymptomatic patients with small cysts and no hydrocephalus. Colloid cysts usually arise in the anterior portion of the third ventricle between the fornices. The cysts are attached to the roof of the third ventricle and frequently to the choroid plexus. Usually, the cysts are immediately dorsal to the foramen of Monro. These cysts have also been reported to frequently arise in the septum pellucidum, the fourth ventricle, and the sella turcica. If patients are too ill to tolerate surgical resection, then cerebrospinal fluid (CSF) diversion, often requiring bilateral shunts, may be considered. This situation is suboptimal because sudden death has been reported in the absence of acute obstructive hydrocephalus. Cohen-Gadol AA. Minitubular transcortical microsurgical approach for gross total resection of third ventricular colloid cysts: technique and assessment. World Neurosurg. 2013 Jan. 79(1):207.e7-10. [Medline]. Dlouhy BJ, Dahdaleh NS, Greenlee JD. Emerging technology in intracranial neuroendoscopy: application of the NICO Myriad. Neurosurg Focus. 2011 Apr. 30(4):E6. [Medline]. Horn EM, Feiz-Erfan I, Bristol RE, Lekovic GP, Goslar PW, Smith KA, et al. Treatment options for third ventricular colloid cysts: comparison of open microsurgical versus endoscopic resection. Neurosurgery. 2007 Apr. 60(4):613-8; discussion 618-20. [Medline]. Engh JA, Lunsford LD, Amin DV, Ochalski PG, Fernandez-Miranda J, Prevedello DM, et al. Stereotactically guided endoscopic port surgery for intraventricular tumor and colloid cyst resection. Neurosurgery. 2010 Sep. 67(3 Suppl Operative):ons198-204; discussion ons204-5. [Medline]. Sampath R, Vannemreddy P, Nanda A. Microsurgical excision of colloid cyst with favorable cognitive outcomes and short operative time and hospital stay: operative techniques and analyses of outcomes with review of previous studies. Neurosurgery. 2010 Feb. 66(2):368-74; discussion 374-5. [Medline]. Harris AE, Hadjipanayis CG, Lunsford LD, et al. Microsurgical removal of intraventricular lesions using endoscopic visualization and stereotactic guidance. Neurosurgery. 2005 Jan. 56(1 Suppl):125-32; discussion 125-32. [Medline]. Hellwig D, Bauer BL, Schulte M, Gatscher S, Riegel T, Bertalanffy H. Neuroendoscopic treatment for colloid cysts of the third ventricle: the experience of a decade. Neurosurgery. 2003 Mar. 52(3):525-33; discussion 532-3. [Medline]. Shapiro S, Rodgers R, Shah M, Fulkerson D, Campbell RL. Interhemispheric transcallosal subchoroidal fornix-sparing craniotomy for total resection of colloid cysts of the third ventricle. J Neurosurg. 2009 Jan. 110(1):112-5. [Medline]. Osorio JA, Clark AJ, Safaee M, Tate MC, Aghi MK, Parsa A, et al. Intraoperative Conversion from Endoscopic to Open Transcortical-Transventricular Removal of Colloid Cysts as a Salvage Procedure. Cureus. 2015 Feb. 7 (2):e247. [Medline]. Symss NP, Ramamurthi R, Kapu R, Rao SM, Vasudevan MC, Pande A, et al. Complication avoidance in transcallosal transforaminal approach to colloid cysts of the anterior third ventriclen: An analysis of 80 cases. Asian J Neurosurg. 2014 Apr. 9 (2):51-7. [Medline]. Gutierrez-Lara F, Patiño R, Hakim S. Treatment of tumors of the third ventricle: a new and simple technique. Surg Neurol. 1975 Jun. 3(6):323-5. [Medline]. Bosch DA, Rähn T, Backlund EO. Treatment of colloid cysts of the third ventricle by stereotactic aspiration. Surg Neurol. 1978 Jan. 9(1):15-8. [Medline]. Powell MP, Torrens MJ, Thomson JL, Horgan JG. Isodense colloid cysts of the third ventricle: a diagnostic and therapeutic problem resolved by ventriculoscopy. Neurosurgery. 1983 Sep. 13(3):234-7. [Medline]. Beaumont TL, Limbrick DD Jr, Rich KM, Wippold FJ 2nd, Dacey RG Jr. Natural history of colloid cysts of the third ventricle. J Neurosurg. 2016 Mar 11. 1-11. [Medline]. Lawrence JE, Nadarajah R, Treger TD, Agius M. Neuropsychiatric Manifestations of Colloid Cysts: a review of the literature. Psychiatr Danub. 2015 Sep. 27 Suppl 1:S315-20. [Medline]. Stoodley MA, Nguyen TP, Robbins P. Familial fatal and near-fatal third ventricle colloid cysts. Aust N Z J Surg. 1999 Oct. 69(10):733-6. [Medline]. Pollock BE, Schreiner SA, Huston J. A theory on the natural history of colloid cysts of the third ventricle. Neurosurgery. 2000 May. 46(5):1077-81; discussion 1081-3. [Medline]. de Witt Hamer PC, Verstegen MJ, De Haan RJ, Vandertop WP, Thomeer RT, Mooij JJ, et al. High risk of acute deterioration in patients harboring symptomatic colloid cysts of the third ventricle. J Neurosurg. 2002 Jun. 96(6):1041-5. [Medline]. Ryder JW, Kleinschmidt-DeMasters BK, Keller TS. Sudden deterioration and death in patients with benign tumors of the third ventricle area. J Neurosurg. 1986 Feb. 64(2):216-23. [Medline]. Algin O, Ozmen E, Arslan H. Radiologic manifestations of colloid cysts: a pictorial essay. Can Assoc Radiol J. 2013 Feb. 64 (1):56-60. [Medline]. El Khoury C, Brugières P, Decq P, Cosson-Stanescu R, Combes C, Ricolfi F. Colloid cysts of the third ventricle: are MR imaging patterns predictive of difficulty with percutaneous treatment?. AJNR Am J Neuroradiol. 2000 Mar. 21(3):489-92. [Medline]. Kurihara N, Takahashi S, Tamura H, Higano S, Furuta S, Jokura H. Investigation of hydrocephalus with three-dimensional constructive interference in steady state MRI. Neuroradiology. 2000 Sep. 42(9):634-8. [Medline]. Doron O, Feldman Z, Zauberman J. MRI features have a role in pre-surgical planning of colloid cyst removal. Acta Neurochir (Wien). 2016 Apr. 158 (4):671-6. [Medline]. Camacho A, Abernathey CD, Kelly PJ, Laws ER. Colloid cysts: experience with the management of 84 cases since the introduction of computed tomography. Neurosurgery. 1989 May. 24(5):693-700. [Medline]. Hoffman CE, Savage NJ, Souweidane MM. The significance of cyst remnants after endoscopic colloid cyst resection: a retrospective clinical case series. Neurosurgery. 2013 Aug. 73(2):233-7; discussion 237-9. [Medline]. Abdou MS, Cohen AR. Endoscopic treatment of colloid cysts of the third ventricle. Technical note and review of the literature. J Neurosurg. 1998 Dec. 89(6):1062-8. [Medline]. Akins PT, Roberts R, Coxe WS, Kaufman BA. Familial colloid cyst of the third ventricle: case report and review of associated conditions. Neurosurgery. 1996 Feb. 38(2):392-5. [Medline]. Bavil MS, Vahedi P. Familial colloid cyst of the third ventricle in non-twin sisters: Case report, review of the literature, controversies, and screening strategies. Clin Neurol Neurosurg. 2007 Jun 8. [Medline]. Beems T, Menovsky T, Lammens M. Hemorrhagic colloid cyst: case report and review of the literature. Surg Neurol. 2006 Jan. 65(1):84-6. [Medline]. Buttner A, Winkler PA, Eisenmenger W, Weis S. Colloid cysts of the third ventricle with fatal outcome: a report of two cases and review of the literature. Int J Legal Med. 1997. 110(5):260-6. [Medline]. Inci S, Al-Rousan N, Söylemezoglu F, Gurçay O. Intrapontomesencephalic colloid cyst: an unusual location. Case report. J Neurosurg. 2001 Jan. 94(1):118-21. [Medline]. Jarquin-Valdivia AA, Rich AT, Yarbrough JL, Thompson RC. Intraventricular colloid cyst, hydrocephalus and neurogenic stunned myocardium. Clin Neurol Neurosurg. 2005 Aug. 107(5):361-5. [Medline]. Kumar S, Singh AK, Sachdev M. Colloid cyst of third ventricle--a study of 11 cases. J Indian Med Assoc. 1998 Nov. 96(11):351, 353. [Medline]. Mathiesen T, Grane P, Lindgren L, Lindquist C. Third ventricle colloid cysts: a consecutive 12-year series. J Neurosurg. 1997 Jan. 86(1):5-12. [Medline]. 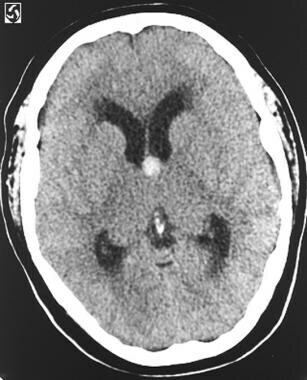 Müller A, Büttner A, Weis S. Rare occurrence of intracerebellar colloid cyst. Case report. J Neurosurg. 1999 Jul. 91(1):128-31. [Medline]. Pollock BE, Huston J. Natural history of asymptomatic colloid cysts of the third ventricle. J Neurosurg. 1999 Sep. 91(3):364-9. [Medline]. Poreh A, Winocur G, Moscovitch M, Backon M, Goshen E, Ram Z. Anterograde and retrograde amnesia in a person with bilateral fornix lesions following removal of a colloid cyst. Neuropsychologia. 2006. 44(12):2241-8. [Medline]. Rodziewicz GS, Smith MV, Hodge CJ Jr. Endoscopic colloid cyst surgery. Neurosurgery. 2000 Mar. 46(3):655-60; discussion 660-2. [Medline]. Tanei T, Fukui K, Kato T, Wakabayashi K, Inoue N, Watanabe M. Colloid (enterogenous) cyst in the frontal lobe. Neurol Med Chir (Tokyo). 2006 Aug. 46(8):401-4. [Medline]. Timurkaynak E, Izci Y, Acar F. Transcavum septum pellucidum interforniceal approach for the colloid cyst of the third ventricle Operative nuance. Surg Neurol. 2006 Nov. 66(5):544-7; discussion 547. [Medline]. Urso JA, Ross GJ, Parker RK, Patrizi JD, Stewart B. Colloid cyst of the third ventricle: radiologic-pathologic correlation. J Comput Assist Tomogr. 1998 Jul-Aug. 22(4):524-7. [Medline]. Young WB, Silberstein SD. Paroxysmal headache caused by colloid cyst of the third ventricle: case report and review of the literature. Headache. 1997 Jan. 37(1):15-20. [Medline]. Coronal MRI shows a colloid cyst in the roof of the third ventricle. The patient has mild hydrocephalus. Intraoperative photograph through the operating microscope shows a colloid cyst in the Monro foramen. Choroid plexus is observed overlying the cyst, and the thalamostriate vein is along the inferior border. Intraoperative photograph that shows removal of the cyst, leaving a dilated Monro foramen. The third ventricle can be seen through the opening.